16.Now we will determine the bubble links. The first video file imported is, by default, the "First Play." It is automatically linked to the top bubble shown to the right. The first play can be a video, as in this example, or a menu. The "Title" bubble links a video or menu to display when the end-user presses the "title" button on the set-top players remote. 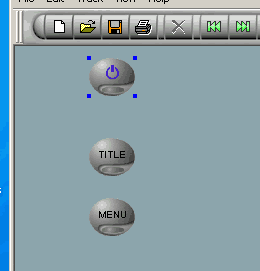 The "Menu" bubble is linked to the menu that will be displayed when the end-user presses the "Menu" button. 17. Link these bubbles by dragging a line from the small oval inside the bottom of the bubbles to the appropriate item in the Storyboard. 18. You would normally want your Main Menu to display immediately following your "First Play." To make this happen, we create a "next link" from the "First Play" onto the Main Menu. We do this by dragging from the right side of the "First Play" and dropping the arrow onto our Main Menu. A Blue arrow now denotes the "next link." 19. It is now time to test your project using the Preview Window. To make the window larger, right click on its border area, and uncheck "Allow Docking." This will increase your screen size and allow for more accurate testing. 20. Click the red button at the bottom left of the preview window to begin the simulation. 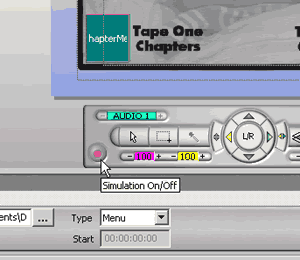 The simulation will begin from whatever video file or menu is selected in the Storyboard. To do a full test, you must select your "First Play" before pressing the simulation button. Note: Expect your Audio and Video to be out of sync. This simulator is not designed to do an accurate playback of your DVD. It is simply designed as a testing ground for play order, button links, button order, and general functionality of the authoring you've just done. 21. Once your happy with what you've see, go to File>Make Disc. Check the boxes you'd like & name your DVD. "Create DVD Video Files" will create the VIDEO_TS and AUDIO_TS folders DVD players read. You can use these folders to further test your DVD with WinDVD (this came with your copy of Reel.) "Create Disc Image" can be used to burn your DVD using a utility like Prassi (this may have come with your DVD Burner.) If your DVD burner is compatible with Reel, you can have Reel burn your DVD directly. This can be done with the Pioneer A03. I've done this many times, always with good results. ENJOY! !